Caption slip reads: "Photographer: Wesselmann. Date: 1958-05-22. Reporter: Towers. Assignment: Queen of L.A. Higher-Up Club at Villa Capri. Special instructions: Sunday or Monday. 1: Queen Maxine Livingston, 24, with her robe and roses right after she was chosen. 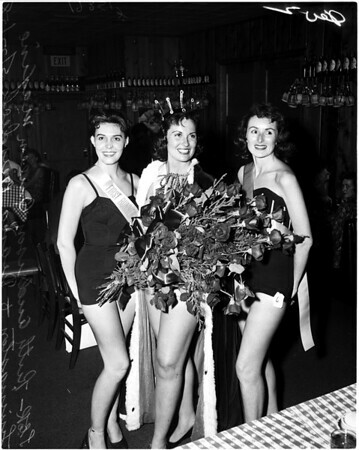 2: Queen Maxine Livingston, 24, poses with runners-up Ruth Anderson, 29, left, and Diana Burdick, 22, right".